We came, we saw, we conquered …..
….. and we gave you watered wine and fish paste! On Saturday 28th May the Trendles Project team hosted two stalls at the Roman Food and Drink Festival at Corinium Museum, Cirencester. Our first stall had a selection of Roman pottery eating and drinking vessel fragments found at our site, plus some complete examples of Roman pots kindly loaned by volunteer Trevor Greer. Patsy Jones, one of our pottery team, also exhibited a collection of Roman oysters from the excavations, demonstrating how close analysis of features like encrustations and infestations and thickness can “make dead oysters talk”. This detailed analysis can throw light on all sorts of things such as the specific coastal origin of the oysters, whether they were commercially exploited or grew naturally, and even the status of the people who ate the oysters. The excavations have produced thousands of oyster fragments from the Roman layers, all of which have been catalogued in detail, following a recording system devised by oyster expert Jessica Winder. 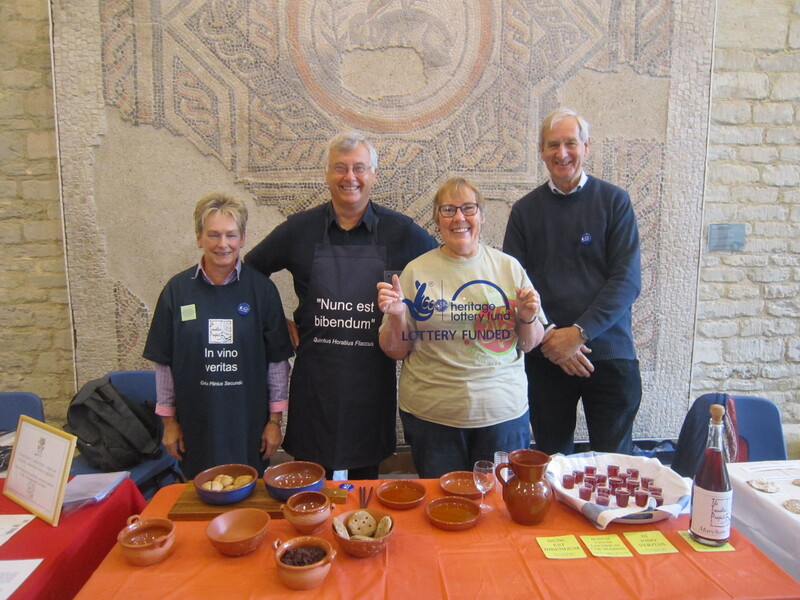 Our second stall had a selection of Roman breads, dips, and mulled wine for visitors to taste – all prepared by volunteer and Trendles Manager Simon Blackmore. Volunteer Fredericka Smith and Project Manager Sheila Raven took on the role of serving wenches at Simon’s Roman food kitchen – though our Latin wasn’t up to much badinage with the customers! The food and the delicious mulled wine was made according to authentic Roman recipes from original sources such as Apicius. The bread was all made out of the spelt flour commonly used in the past, and just like authentic Roman bread it was unleavened. Some of the bread mixture had eggs, honey, and ricotta cheese added to make the more luxurious sweet buns that might well have been used as offerings to the gods at shrines sites like Marcham. At the other extreme was some Roman legionary marching bread or ‘buccellatum’ for people to sample, enriched with lard and baked till it was hard. Just as with later army rations, this ‘hardtack’ (a version of which is still used in the modern navy) could last for months, and was used on long campaigns. The wheat ration for Roman soldiers was often given in the form of hardtack or wheat biscuits, as it was easier to carry than flour and could be mulched down with water or wine or honey if necessary. Those visitors whose teeth were up to it, bravely tried the legionary hardtack, and one ex-army man liked it so much he asked for the recipe! The Roman-style dips included a modern fish sauce to demonstrate the Romans’ love of a strong salty fish paste called ‘garum’. Ours was a much milder version of the very potent Roman recipe! We also had a Roman-style mulled wine mix called ‘mulsum’ for people to try. This is a very watered down wine mixed with honey and some spices and it proved extremely popular with the visitors (and the Trendles team). The wine made in the Roman period was often very strong and was commonly watered down and often mixed with things like honey. It was considered very barbaric to drink it straight and un-watered, so our modern habit of consuming large glasses of wine at the end of a long day at the office would be considered very uncouth! Roman soldiers and poorer people would often have to make do with a sour watered wine mixed with herbs, called ‘posca’. Our version of this, made with wine vinegar, proved to be a bit of an acquired taste. Those Roman soldiers had a lot to put up with! The visitors to our stall seemed to enjoy all the food and drink tasters (perhaps with the exception of the vinegar wine and the hardtack biscuits) and I am pleased to say no dormice, stuffed or otherwise, were served on our veggie-friendly stall. 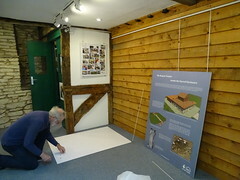 More fascinating talks and displays related to the Roman Food and Drink Festival will continue throughout June at Corinium Museum in Cirencester.